I have not been able to cover as many Tibetan films as I would have liked here. There was the problem of time, length and the fact that much of what is produced in Tibet is not available to us in exile. Even the works of exile filmmakers are not always accessible because of lack of information and distribution. Comments by readers on films I might have missed would be appreciated. Apologies for not posting this on “tsepa sum” as I promised. I was in New York for Losar and left the adapter cord for my Mac behind. From their first encounter with the modern world Tibetans appear to have taken to such inventions as photography with relative insouciance – considering Tibet’s reputation as a “forbidden land”. We hear of a Tibetan using a camera, and even compiling a photography manual, around 1881-82. The cine-camera, of course, came a bit later. We know Tsarong had a projector in 1920 and appears to have acquired a movie camera some years later. Heinrich Harrer tells us that he saw some films shot by Tsarong’s son Dundul Namgyal, and was impressed at the professional quality of the work. Old man Tsarong himself filmed the Anglo-Tibetan football (soccer) matches outside Lhasa in 1936. Jigme Taring was another Tibetan official who was an enthusiastic and competent cinematographer. He filmed scenes of festivals and street life in Lhasa. Probably his most viewed and important work is the film documentation of the 14th Dalai Lama official tour of Sera, Drepung and Ganden and his religious examinations, particularly the viva voce for his Geshe degree in 1948. The late Chogyal of Sikkim, Palden Thondup Namgyal, also shot extensive footage of his native Sikkim and his visit to Tibet in the mid-fifties. The film footage of the Dalai Lama’s escape in ’59 were shot by the resistance photographer, Tsonkha Janjup Jinpa, who also filmed some of the operations of the Four Rivers and Six Ranges in Lhoga. The CIA supplied some of the air dropped missions into Tibet with still and cine-cameras, and instructions to record as much of their operations as reasonably possible. The first Tibetan feature film was most likely made in the mid seventies (?) 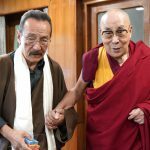 by the late Gungthang Tsultrim, director of the Tibetan refugee community at Clement Town in Dehradun district, and head of the Thirteen Group (tsokha chuksum) of Tibetan settlements. Tsultrim founded the Amdo Dance and Drama Society in the early sixties and produced and directed a musical drama on the life of the Tibetan Emperor, Songtsen Gampo. To make his feature film, Tsultrim hired equipment, professional cameramen other technical personnel from Bombay. I have been told that the film was partly shot in Clement Town itself but mostly in Ladakh. My informant was fairly certain that the film had a definite story line, and recreated scenes of life in old Tibet, particularly Amdo. 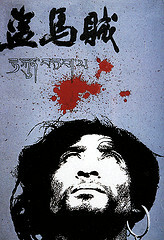 Because of Tsultrim’s political differences with Gyalo Thondup, the Dalai Lama’s brother, and the government-in-exile, this pioneering example of Tibetan filmmaking has been largely unknown to Tibetan society, and the negative and prints of this film appear to have been lost after Tsultrim’s murder in 1977. I recall that The Illustrated Weekly of India did a write-up on this film with photographs of scenes from the film, but I have never been able to get hold of that issue. 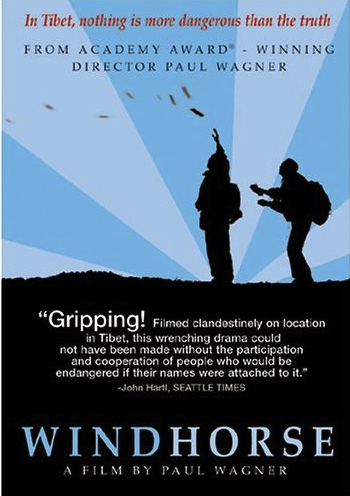 I recently learned that this film has been recovered and I am hoping that it will be available for viewing fairly soon. In lieu of definite information about Tsultrim’s film we would have to consider Khyentse Norbu’s Phorpa (The Cup, 1999) to be the first proper full-length Tibetan feature film. The work of an eminent lama (Dzongsar Jamyang Khyentse Rimpoche) Phorpa was a tremendously successful first film, winning a prize at Cannes and receiving awards and accolades worldwide. Though a slice-of-life observation of a spiritual community in exile the film is joyously irreverent. Rimpoche entertains us with a hilarious story of some young monks whose devotion to Buddhism is rivaled by their fervor for football and the 1998 World Cup, but at the same time he also makes us realize, with great skill and subtlety, how the tragedy of Tibet is never quite far away from our lives. Rimpoche, who is Bhutanese/Tibetan, has made Bhutan the subject of his second film Travellers and Magicians which was released in 2004. A year earlier saw the release of Lungta (Windhorse) 1998, which, though directed by an American, Paul Wagner, had considerable Tibetan input in its creation. 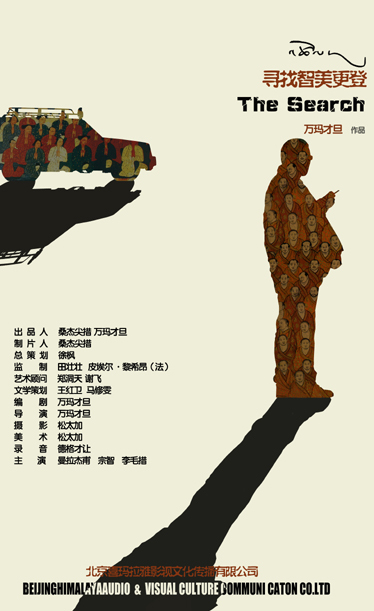 With a Tibetan screenwriter, Thupten Tsering, and other young Tibetans participating, this was one of the few feature-films that directly addressed the political repression in Chinese-occupied Tibet. A number of sequences were covertly shot in Lhasa city, in a kind of guerrilla filmmaking, which gave the production a hard cinéma vérité edge. A video-film, Tsampai Shenkhok or Loyalty (1999) produced by the Tibetan Institute of Performing Arts, and directed by Jamyang Dorjee, was released in 1999. 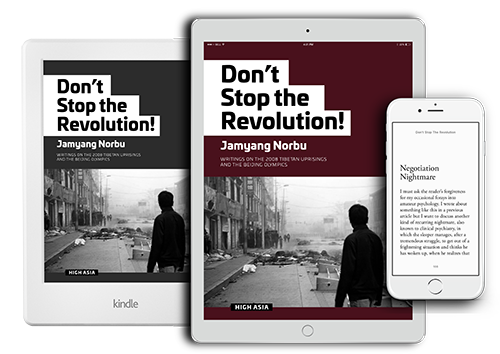 It tells the story of young Tibetans in Lhasa city defying the Chinese occupation forces. The story was adapted from the Indian film Shaheed. Another film drawing inspiration from Indian cinema is Pema Dhondup’s, We Are No Monks (2004). The film deals with the dichotomy of young refugees attempting to create a normal life in their exile world, but feeling their patriotism pulling them in another direction. Bollywood actor, Gulshan Grover, is cast as a local police officer who encounters these confused and angry young men. Probably the most professional and artistically conscious production following the release of the The Cup was Dreaming Lhasa, from the husband/wife team of Tenzin Sonam and Ritu Sarin. Released at the end of 2004, the film tells the story of a young Tibetan woman, a filmmaker from the United States, finding friendship, and at times frustration and sorrow in the refugee community in India. In Dharamshala she is drawn into the strange search of a new arrival from Tibet for his father, a long-vanished resistance fighter. The film takes us through the nooks and crannies of the Tibetan exile world in India: McLeod Ganj, Jaipur, Jantar Mantar, Sadar Bazaar, Majnukatilla and even high Triund, in a dramatic and fascinating quest, which in the end resolves not just into the discovery of the missing father, but in a way the meaning of Tibet. Tenzin and Ritu are also successful documentary filmmakers. Five of these are about Tibet: The Reincarnation of Khentse Rimpoche (1991), The Trials of Telo Rimpoche (1994), A Stranger in My Native Land (1998) and The Shadow Circus: The CIA in Tibet (1998). Their most recent film Sun Behind the Clouds (2010) won “The Best of the Fest” Award at Palm Springs Film Festival, and upset Beijing enough into withdrawing its two entries. Tsering Rhitar, a resident of Kathmandu, won a major South Asian documentary film award with The Spirit Doesn’t Come Anymore (1997). He has also made a feature film Mukundo (1999) about a female shaman of Nepal. Another Kathmandu-based Tibetan filmmaker, Kesang Tseten, has a number of documentaries to his credit, as We Homes Chaps (2001) and On the Road With the Red God (2004). With the advent of affordable digital cameras quite a few small films have been made in the Tibetan exile community. Such films as New York Mare Meyok Ray, Richard Gere is My Hero, Pun Anu Thanu and others (whose write-ups and ads often appear in Phayul.com) visibly express the energy and enthusiasm of new Tibetan filmmakers. Perhaps what these young movie makers need to attract attention beyond their present audience base of young exiles, is a greater investment of study, technical skill and overall experience in their productions. Two of the earliest Communist filmmakers in Tibet appear to have been Czechs – director Vladimir Sis and camera man Josef Vanis – who were in the country from 1953 to 1955. They were the leaders of the joint Sino – Czechoslovak team that made a colour documentary film on the construction of the Sichuan-Tibet military highway, from Dhartsedo to Lhasa. They also shot their own feature documentary, On the Road Through Tibet , that won awards at international film festivals at Venice and Carlsbad in 1956. Sis and Vanis appear to have participated in the training of Chinese documentary filmmakers. The first major propaganda film made by the Chinese in Tibet was the documentary Zingtru Lhingchak (Peaceful Suppression of Rebellion) made immediately after the March Uprising and screened all over Tibet and China. Most of the scenes of the fighting and the surrender of Tibetan fighters including the old commander in chief Tsarong Dasang Damdul, were re-enactments. The dramatic scene of the full-scale assault of the Chakpori redoubt (“Yowang” Hill) by Chinese soldiers, which has since appeared in nearly every documentary of the Tibetan struggle, was completely re-enacted. The finale of the movie was the staged demonstration by “20,000” citizens of Lhasa “voicing determined support for the complete suppression of the rebellion”, culminating in a giant public rally before the Potala, replete with massed red flags and giant banners. The film also shows “torture instruments”, thigh bone trumpets, human skulls etc., that have since become mandatory elements of Chinese propaganda visuals. One scene of Tibetan feudal barbarity, the “scorpion-filled dungeons” of the Potala, was exposed by eyewitness Thupten Khetsun (Memories of Life in Lhasa Under Chinese Rule) as a complete fabrication where the scorpions for the dungeon scene, were caught by Tibetan children conscripted for the task. Most films made in Tibet before the eighties were such propaganda documentaries and newsreels. Very few feature films were made. An informant, Tsering Wangchuk of Lhasa, claimed that only three feature films were actually made in Tibet in the sixties and seventies. 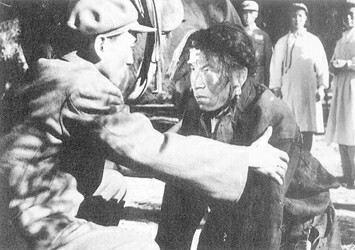 The Serf (Shingdren/Nongnu) was made in 1963 by a PLA film unit and directed by Li Jun. The film (also called Jampa) tells the story of a young orphan serf whose parents were killed by a cruel landowner. Jampa toils as a “human horse” for the landowner’s son, and is so starved that he steals tsampa-dough offerings (torma) from a monastery. He is caught by brutish looking monks and beaten mercilessly. The monks tell him that since he has stolen and eaten sacred tormas he will be struck dumb. The serf is unable to speak from then on, and suffers more tortures at the hand of his feudal masters. Finally the “People’s Liberation Army” marches into Tibet. A few more scenes of battles and oppression and our wretched serf is finally liberated. Jamba then releases a cry of anguish and utters his first words, the name of Chairman Mao! This film was screened all over China and Tibet and schoolchildren were required to see it. The film was probably effective, especially to Chinese audiences, in conveying the message that old Tibet was “hell on earth”, but the depiction of Tibetan people as dirty and barbaric appears to have offended many Tibetans, especially in Lhasa. I was told that the citizens of the holy city did not refer to the film by its official title of The Serf, but as Torma Kuma or The Torma Thief. The theft of a religious object (even a negligible one as a tsampa cake) assuming more significance in the Tibetan mind than the class-struggle and revolutionary aspects of the film. A third movie was made in the sixties about events in Eastern Tibet. My informant told me that the film had a lot of action, singing and dancing. What should be noted is that other than as actors and extras Tibetans had no role in the making of these films. In 1980, or thereabouts a film, Siri Metok (Alpenrose) was made about an exile Tibetan from India returning to Amdo and being reunited with a daughter he had never known. Since the mid eighties TAR and regional TV companies, in cooperation with some film studios and theatrical troupes produced TV films, series, comedy programs and documentaries on Tibetan subjects and themes, with an eye to commercial distribution. Though Tibetan actors and screenwriters were used, the films were all directed and produced by Chinese filmmakers. In 1989 Tibet Regional Theatre Troupe and Emei Films, came out with the big budget film, The Secret History of the Potala Palace (Potalae Sangtam/Budala Gong Mishi). Directed by Zhang Yi, the film told the story of the story of 5th Dalai Lama and his regent Desi Sangye Gyatso, who is said to have tricked the Chinese Emperor. The film was reportedly banned because it showed the 5th Dalai Lama meeting the Chinese Emperor in 1652 and not performing the kow-tow. One TV series, Wind and Clouds over Tibet (Bhodjong dhus gyur/Xizang Fengyun ) CCTV, 2000, depicted the Chinese invasion of Tibet and the futile efforts of the Tibetan ruling class to resist it. It included scenes of CIA missions into Tibet and the March Uprising, all, of course, from an official Chinese point of view. Nonetheless the mere fact of showing a pre-invasion Tibet with its own government, flag and an army that resisted the Communist invasion (no matter how ineffectually) came as major revelation to many young Tibetans in Tibet. Parts of the film were censored. This was followed by other TV drama series depicting the lives of people (mostly aristocrats!) in old Tibet. A friend of mine sent me (in video CD) a twenty part series The Tale of Lhasa’s Past (Lhasae ngonjung tamgyud), a collaborative effort of CCTV and Tibet TV. The series based on the novel God Without Gender by the Tibetan writer Yangdon was aired in 2001. Another series produced by Tibet TV in 2002 was, In the Direction of Lhasa (Lhasar chogpa). The first Chinese film on Tibet released in the West was The Horse Thief (1986), directed by Tian Zhuangzhuang. The film is a virtual compendium of Tibetan traditions and practices that Chinese find barbaric yet fascinating, like sky-burial, “ghost-dances” (cham performances), and some “customs” made up along the way, out of whole cloth, such as the banishment of the titular Norbu from his tribe for stealing horses, and his “punishment by effigy”, which could perhaps be a garbled reference to the Losar ritual of the scapegoat king (logong gyalpo). The film takes full advantage of Tibet’s dramatic and breathtaking landscape, and, overall it received glowing reviews in the West. Martin Scorsese considered it his top favorite for 1990. Some Tibetan friends of mine at the time, disagreed with my take on the film, regarding The Horse Thief as a welcome improvement over previous Chinese propaganda films. Sure, it wasn’t The Serf, but it was racist, at the very least. It presumed, without question, that Tibetans were savages. Perhaps a noble savage in the case of Norbu (who is often shot in profile, posing dramatically against the Tibetan skyline) but savages nonetheless. My friends argued that I should not allow my personal feelings to blind me to the film’s artistic and technical merits. I didn’t think the film had merit, but even if it did, my feelings were those of Malcolm X, who in his biography recalls cringing in a Detroit film theater when he first saw Gone With the Wind. Quite a few other Chinese films on Tibet appeared following the Horse Thief, a laughably bad one being Red River Valley, on the British invasion of 1904. I am not going any further into Chinese directed films on Tibet, but will share with the reader whatever I have managed learn about Tibetan filmmakers in Tibet who have begun to create their own works. I want to make it clear that I have not seen many of these films, but just heard accounts and read news-reports, and I would be grateful if readers could point me to where I could get them on DVD or CD. In Amdo, Phagmo Tashi a director of music videos came out with Longing in 1993. Then the Amdo writer and scholar Jangbu (Dorji Tsering Chenaktsang) who had written a brief history of Tibetan films, came out with his own documentary, Ani Lhacham (2006) about a young nun seeking the meaning of happiness. Jangbu had earlier written screenplays for Chinese filmmakers on Tibetan subjects. “Lisa Lim of NPR reported that “The film and its director tread a delicate tightrope, tiptoeing around controversial political issues. As a Tibetan film, the picture underwent stricter censorship than other Chinese films. 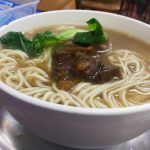 It was vetted by the State Administration of Film, Radio and Television, as well as by the Religious Affairs Bureau and the United Front Work Department, which manages relations with ethnic minority groups in China.” The NPR report is at http://www.npr.org/templates/story/story.php?storyId=106089201. You can also access the trailer at this site. Movie making got off to an auspicious start in Sikkim with Satyajit Ray shooting a documentary on this Himalayan kingdom. The film, Sikkim, was commissioned by the Chogyal in 1972. After India’s takeover of Sikkim the documentary was banned. Ray expressed disappointment with the Government of India’s decision, saying that when it was made Sikkim was clearly a separate country and that the film could be viewed in the present day as a document of the past. Sikkim’s first feature film Romeo in Sikkim (1977?) was financed and produced by a Sikkimese businessman, K. B Pradhan, and directed by his son Shyam, who also played the lead role. An entire Indian film crew was hired from Bombay. The film never got past its grand premiere at the Star Cinema at Gangtok. It probably failed not so much for its production values which were entirely Bombay, but because the leading man (who was on the small side) was unable to fill the larger-than-life persona required of Bollywood heroes. Ladakh’s first feature film, Sonam Dolma (1996) was the work of the popular singer/actor Phuntsok Ladakhi. The film was made in the Ladakhi dialect and deals with social issues of young Ladakhi men turning away from their Buddhist culture because of tourism and fast money. It was funded by Doordharshan and shot on 35mm film. 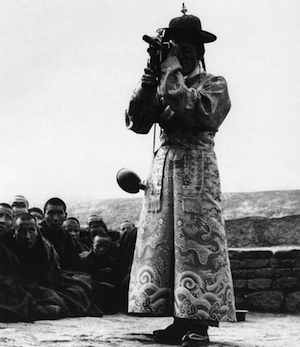 Unlike Khentse Norbu, most early filmmakers in Bhutan seemed to have started off modestly with video films. I first came across a few of these produced by a youth organization, Nazhon Phuntsok Drayang from Thimphu, one being Phama or Parents directed by Palden Dorjee. Another feature by the same director was shot in 1998 in film. Mieyi Dugnyel (Man’s Suffering) tells the story of drugs, alcohol, zee-stone smuggling, barroom brawls and chorten robbery in the Dragon Kingdom. The two young leads, school-dropouts, in the end suffer from karmic retribution – leprosy. The film industry in Bhutan has grown considerably since then, and one comes across the names of such filmmakers as Tshering Wangyal, Karma Tshering, Nima Yoezer, Kesang P Jigme, Sonam Yeshey, Lhamo Drukpa and other in the pages of Bhutan’s English language paper Kuensel. Bhutan even has its own annual film awards ceremony. I understand that Bhutanese films and TV drama serials are very popular in the Tibetan exile community, at least in Dharamshala, where they are shown regularly on the local cable network. The combination of shared Buddhist values, similar lifestyle and cultural mores, language accessibility and the Bollywood style singing, dancing and action appear to be irresistible. When I was director of TIPA from 1980 to ’85, I worked on broadening the cultural perspective of my students and artistes by introducing them to world cinema. This was before the days of videos. Unlike the Indian hill-stations of Darjeeling or Mussoorie, where Western films were shown regularly in local cinemas, Dharamshala only had the Himalaya Talkies which screened a scratched print of Shenandoah once every year or so, besides its regular fare of Hindi films. TIPA had been given a 16mm projector by Rikha Lobsang Tenzin, secretary of the Education Department, and I managed to locate a film library in Bombay that had a great collection of early Hollywood classics in 16 mm, at affordable rates. So it was not long before TIPA students got to see King Kong (the wonderful old version), the Thief of Baghdad, Prisoner of Zenda, Flash Gordon, Robin Hood, Captain Blood, Buck Rogers, Ivanhoe, Tarzan, The Phantom, Destry Rides Again, The Seven Voyages of Sinbad, Jason and the Argonauts, Mighty Joe Young (with stop-action animation by the great Ray Harryhausen), and many other memorable films of my childhood. Soon afterward the principal of the Tibetan Children’s Village asked me to select films to show their students. We also showed Nosferatu (1922) and The Cabinet of Dr. Caligari (1920) the seminal films of vampire lore and German Expressionism, respectively, (both complements of the West German Embassy in Delhi) and the early Dracula (1931) with Bela Lugosi. Tibetans called Dracula, “dre-ku-la, the “dre” being the Tibetan generic word for ghosts, demons and monsters. Dracula’s assistant, Renfeld (I think he was called) was dubbed with one of the wonderful contractions that the Tibetan language is capable of – “dre-yok” or demon servant. A more organized and broader effort at public film education was undertaken at Dharamshala by the Amnye Machen Institute. It initially hosted “World Cinema Appreciation Evenings”, with screenings of and discussion on such great films of national liberation as, The Battle of Algiers, and A Vad (The Prosecution) by the award winning Hungarian film-maker, Sandor Sara who attended the Dharamshala screening. A Kurosawa Retrospective was held after the death of the great director, and the world premiere of the Shadow Circus: the CIA in Tibet, by Tenzin Sonam and Ritu Sarin. AMI also hosted a screening of documentaries by Tibetan directors and video-shorts by first time filmmakers. AMI organized The Festival of Swiss Films in 1997 in Dharamshala, with the collaboration of the Arts Council of Switzerland, Cinema Xenix of Zurich, TIPA and the Swiss embassy. A similar Japanese Film Festival was held in 2000 with the collaboration of the Japanese Embassy. A Satyajit Ray retrospective and a SCI-FI film festival were also in the works. It is a pity that the government-in-exile never really saw cinema as a useful tool for promoting the struggle or even educating and informing the Tibetan public. Film and video have been used largely as a medium for recording His Holiness teachings and talks of religious figures and high officials. This, of course, serves an important purpose, but of a limited kind. I mentioned in a previous essay, Cinema ’59, that the Russian Revolution’s use of the cinema to spread its political message and galvanize its mainly rural population was certainly something that the Tibetan freedom movement could emulate. 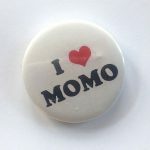 A friend of mine is working on a discussion site for such a purpose (that might be called Cinema ’59) where we could explore such possibilities, and perhaps even implement some of them. Dhondup Wangchen’s Leaving Fear Behind, is one kind of cinema activism from which we could take inspiration, if not pointers, for future projects. Before concluding with a cry of “Cut!” and “Print it!” a little metaphysical obiter dictum might serve to round off this piece. The fact that the power of cinema essentially derives from the projection of an infinite series of fleeting images – illusions – in a darkened room, should make it a telling metaphor to convey such Buddhist concepts as samsara and maya. There were no cinemas in 11th century Neyshapur, but Omar Khayam, using the example of a child’s magic lantern gives us this quatrain. I don’t think I have seen anything like this expressed in the teachings or sermons of contemporary lamas or Buddhist teachers, so I will leave the reader with a verse I came across sometime ago, said to have been penned by Gedun Choephel la in Nangtseshar prison. The original was reputedly destroyed. This present version, I’m told, came from the memory of a lama in exile who knew him well. Besides the textual sources, most of the information for this piece came from conversations I had (over the years) with the late Nornang Ganden la, Lingtsang Thupten Tsering la, the late Chitiling Ngawang Dhakpa la, the late Gyen Lutsa la, Gyen Norbu Tsering la, Tashi Tsering la (of AMI), Tsering Wangchuk la, Jamyang Dorjee la, my uncle TC Tethong, my late grand uncle Tesur Palden Gyaltsen, my late mother, and many other friends and relatives. I must also thank Sonam Dhargyal la for sending me CD copies of films from Tibet, Isrun Engelhardt for documentation on Dikyilinga film shows, and graphic artist Tashi Gyamtso for the AMI film posters and banners, many of which he designed. I think this is the second time you have raised the question of how we could actually go about introducing a multi-party system. Sorry for not getting back to you earlier. I want to assure you that it absolutely can be done, and must be done to save the TGIE and ensure the continuation of the institution of the Dalai Lama. I promise you and other rangzen advocates and activists a clear preliminary road map – no later than mid-December. I am still WAITING patiently for the promised article. What we are trying to do is to put your idea/stuff into action at the soonest possible. I am sure others are losing patience too. But Sonam Dolma was in Hindi and the actress who played the title role was not Ladakhi and did not know Ladakhi. She could only have done it in Hindi. So I wouldn’t really call it the first Ladakhi feature film. Jamyang la, once again I thank for a wonderful documentary. On the subject of films, Dasang Damdul Tsarong and enigmatic character of our days gone by would make a great story for cinema. A tale of rags-to-riches and machismo all rolled into one would inspire many of our modern day youths to remember that Tibet had its share of heroes too. The man was not born an aristocrat, nor was he anointed a Lama yet he managed to rise up to the occasion from the mean streets of Lhasa to become the Commander-in-Chief of the Tibetan army. Wouldn’t his account make a wonderful movie for all audiences? Since some of the events take place in modern Himachal, in Chamba, Lahul etc., the filming could be done at the original sites, no problem. Just my 2 cents worth. Anybody ready to write up a treatment? Jamyang la please write on the Tibetan children taken away forcefully from parent to China in the early years of occupation of Tibet in the light of the recent apologies by UK government to the orphans shipped to Australia after ww2. Did you notice the interview with Tom G. on H.H. the Dalai Lama’s visit to Washington? and the talkback by Josh S.? One of the latest Tibetan feature film released is Semshook. It is being screened in one of the prestigous film festivals in Northern California. ‘Richard Gere is My Hero’ a heartwarming haracter driven film by two Tibetan filmmakers is available on DVD. i bought a copy from MT. Hope it is an original one. Thanks for your article. I am sure Jamnor la knows the famous play “The Lower Depths” by Maxim Gorky and the Japanese adaptation of this drama Donzoko. Although it’s an adaptation, it possesses uniqueness and originality of the Japanese society at the time. I hope Jamnor la could venture into these sorts of artistic pursuit to depict the pre-occupation of Tibet, current situation of Tibetans in Tibet and Tibetans in exile. What is lack in representation is the poor, weak and underprivileged masses in any society under any bureaucracy. Sometimes if you can fill a gap you can make it to the top. “Precious” is an example. To add one more note to the advice; don’t let politics starve your artistic expression. The DVD I watched “Richard Gere is My Hero” was obviously a bootlegged one. I think it’s not purely the money that we Tibetans buy bootlegged copies of these movies. We need to develop respect for artists by respecting the intellectual properties these professions. At the same time to gain respect for you as an artist you need to standout as an artist in your artistic expression. you really need to start taking your medications as you are messing up with your post. Why are you posting the religious stuff here that we had been discussing in another thread? First you don’t understand what I am talking about and then you carry on as if I made these things up in my dream, and now you are posting it in the wrong forum. I was taking some pills made by Men-Tsee-Khang in Dharamsala. I think it’s called Rigsel (རིག་གསལ). It’s something that “brightens my brain” to “clears the confusion of samsara” or something like that. Usually these precious jewels are offered to the Kugay Office to buy a place in heaven for the deceased ones from faithful Tibetans. (I thought we should preserve these ancestral treasures in Museums for the future generations). That’s why I too don’t have enough pills to take everyday as I should. As saying goes, an extra month on top of the drought season, the holy lama who spites on pills to be wrapped in bless has been to the West and hasn’t come back to Men-Tsee_khang for a very long time. So the small amount of pills made from precious jewels into pills by MenTseeKhang are left now in Men-Tsee-Khang without finally approval, that is the spite from the holy lama. (I saw many of these spitting holy lamas in youtube). That’s why my mental status is shady and not very reliable without Rigsel Pills. If you have any extra pill to spare, do so immediately for the sake of this one Bodrig Phunda. Thank you. Thank you so very much for your wonderful eye opening articles and talks related to Tibet. I have thoroughly enjoyed your them and missed almost none. Please keep up your spirit of writings and speeches going and growing. It is priceless. The history of Tibet is already embracing your Rangzen voice, and your efforts will make a big difference some day. We shall overcome ONE DAY. Aku Gunthang Tultrim’s 16 mm documentary movie on Tibet and Tibetan culture was shot and completed in or around 1975-1978. The movie showcases Tibetan way of life which may have been catered to western audience as Tibet was very much unknown and mysterious in 1970s. The movie is called ‘The Roof of the World’. Aku Tsultrim was an incredible leader and had the capacity to think out of box. 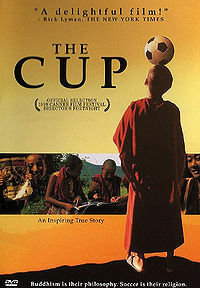 Next Tibetan documentary film was made after 21 years in 1999 (The Cup) another excellent movie by venerable Dzongsar Jamyang Khyentse Rimpoche. This film has now been restored. And after 33 years of hibernation the ‘Roof of the World’ will be viewed again in Clementown during Losar where Aku Gunthang Tsultrim’s memorial statue will also be inaugurated (kinda comes back in full circle)!!! Many of the Tibetan youths who I know are disillusioned with the chimera-like politicians who seem to have fallen victim, by intent or otherwise, to the logic that dialogue ( dialogue’s sake) is better than remaining true to “satyagraha”, or sticking to truth. These politicians have done more damage the cause of Tibet. They have surrendered the truth for nothing in return. Some of these are very good at manipulating the Tibetan public opinions and I beleive demonizing of Rangzeen seekers is only one aspect of their strategy. Please write a book on it. Jamyang la, I am particularly interested in watching Zingtru Lhingchak (Peaceful Suppression of Rebellion). Do you know if the song “Freed Serfs Sing in Happiness” was first sung in it? What is the director’s name of Zingtru Lhingchak and where can I find it? 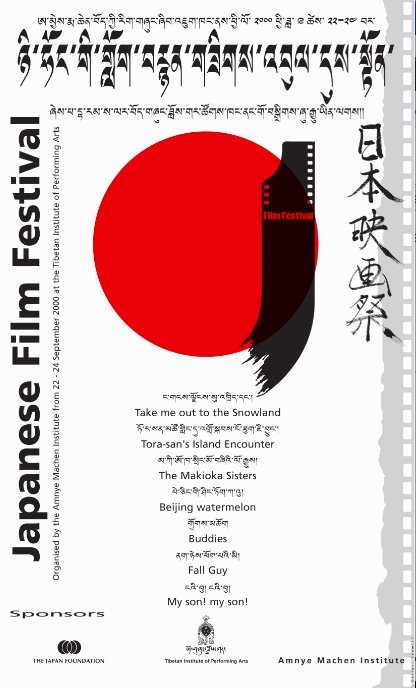 i’am organising a series of tibet related documentaries in berlin in april/mai 2011.
for the catalog / filmprogramm it would be nice to use an extract of your blog article about tibetean filmmakers / happy light bioscope. we’ll screen the white crane films: sun behind the clouds, the reincarnation of khensure rinpoche, kokonor (jangbu) and historic material from the bfi (search the search for shangri-la). I’ll be happy if you could contact me directly.